How happy would you be if your state spent $1.4 billion dollars on the roadways due to poor pavement conditions and safety concerns? Not very happy. According to TRIP, $1.4 billion dollars is estimated to be spent fixing West Virginia’s roads. Who do you think is paying for this? Motorists who are in the following “urban” areas in West Virginia will be paying vehicle operating costs, congestion and safety costs. Charleston | $1,357 per motorist | 17 percent of urban roads are in poor condition. Huntington | $1,121 per motorist | 16 percent of urban roads are in poor condition. Morgantown | $1,439 per motorist | 47 percent of urban roads are in poor condition. Parkersburg | $1,274 per motorist | 29 percent of urban roads are in poor condition. Wheeling | $,315 per motorist | 37 percent of urban roads are in poor conditions. “Statewide, 29 percent of West Virginia’s major roads are in poor condition,” according to TRIP Report. With the growth of West Virginia residents and its economy, it’s incredibly important to fix and maintain the roadways. Many states use a patch to fix potholes. The issue is that these “patches” are not permanent and can come out with the next rain. How do we go about fixing West Virginia’s roads permanently? Meet Pothole Terminator. According to TRIP, for every one dollar spent on road maintenance and repair, $5.20 can be saved, decreasing vehicle maintenance costs, decrease fuel costs, decreased road maintenance and decreased emissions. He discovered Mechanical Concrete® in 2004 and received a U.S. Patent for the technology in 2008. 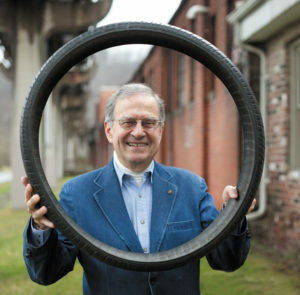 Bonasso developed the idea through the traditional technology development stages of modeling, field tests, lab tests and three full-scale demonstration projects. Would you like to be apart of fixing West Virginia’s roads? Contact us.